Plans for a 20-turbine wind farm in Argyll and Bute have been approved by the Scottish Government. Power from the Carraig Gheal wind farm near Kilchrenan, east of Oban, could supply about 32,000 homes, more than a third of the properties in the area. Green Power Ltd, the company in charge of the project, had originally asked for permission to erect 24 turbines. But it reduced that number to address concerns about the visual impact of the site and the safety of birds. Conditions imposed on the government's consent include a bird monitoring programme to protect local bird populations, which must be approved by Argyll and Bute Council and Scottish Natural Heritage. The decision to approve the plans was taken by Finance Minister John Swinney because the application lay in the constituency of Jim Mather, the energy minister. He said: "Carraig Gheal wind farm will provide a significant amount of electricity used in Argyll and Bute's homes and is another step towards making Scotland the green energy capital of Europe. "We already have the comparative advantage of a vast array of potentially cheap, renewable energy sources in Scotland. "In our drive to fulfil that potential, reduce emissions and achieve our ambitious climate change targets, we are investing in a range of technologies - in onshore and offshore wind, tidal, wave, biomass, and clean coal including carbon capture technology." Green Power's chief executive, Robert Forrest, said the wind farm had been well designed and was sensitive to the local environment. He said construction would begin next year and the £60m project would take two years to complete. Up to £20m of the construction costs could be spent within the local area, he added. 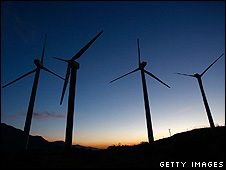 The Scottish Government has set a target to produce 31% of electricity renewable sources by 2011, and 50% by 2020. The Carraig Gheal wind farm will have a generation capacity of 60 megawatts (MW). Any proposal to construct or operate an onshore wind farm with a capacity of more than 50 MW requires the consent of Scottish ministers. Applications for 37 renewable projects are currently being considered by the Scottish Government.